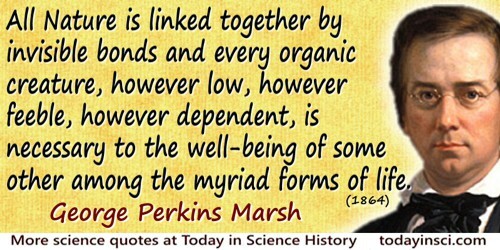 All Nature is linked together by invisible bonds and every organic creature, however low, however feeble, however dependent, is necessary to the well-being of some other among the myriad forms of life. From Man and Nature (1864), 109. 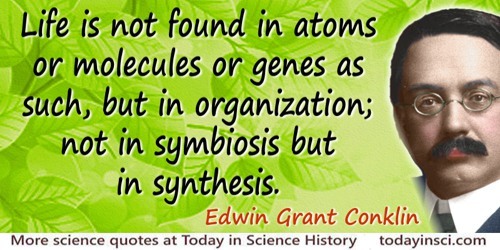 Life is not found in atoms or molecules or genes as such, but in organization; not in symbiosis but in synthesis. In 'Cell and Protoplasm Concepts: Historical Account', The Cell and the Protoplasm: Publication of the American Association of Science (1940), No. 114, 18. The notion that the “balance of nature” is delicately poised and easily upset is nonsense. Nature is extraordinarily tough and resilient, interlaced with checks and balances, with an astonishing capacity for recovering from disturbances in equilibrium. The formula for survival is not power; it is symbiosis. In Encounter (Mar 1976), 16. As quoted and cited in Alan Lindsay Mackay , A Dictionary of Scientific Quotations (2nd Ed., 1991), 13.